Dubrovnik (in Latin Ragusa) is an old city on the Adriatic Sea coastline in the extreme south of Croatia, and is one of the most prominent tourist resorts in the country. The cultural landscape on the Adriatic island of Hvar has remained practically intact since it was first colonized by Ionian Greeks from Paros in the 4th century BC. This property combines 28 sites, located in Bosnia and Herzegovina, western Serbia, western Montenegro and central and southern Croatia with distinctive medieval tombstones, or stecci mostly carved from limestone. The cemeteries date from the 12th to 16th centuries, and are laid out in rows, as was the common custom in Europe from the Middle Ages. 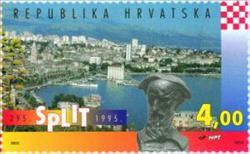 Joint listing with Italy and Montenegro. This property consists of 15 components of defence works in Italy, Croatia and Montenegro, spanning more than 1,000 kilometres between the Lombard region of Italy and the eastern Adriatic Coast. The fortifications throughout the Stato da Terra protected the Republic of Venice from other European powers to the northwest and those of the Stato da Mar protected the sea routes and ports in the Adriatic Sea to the Levant.